I have had close relationship with a radio and comms expert “Frank” since 1994. At that time Frank worked for another company when I met him to obtain a 2 wire surveillance kit for myself that I attached to the radios of another groups. Frank helped me personalize my gear according to my own specs to include molded earpieces. Whenever I am in the need to supplement my cache of radios with extras call Frank and I am set. I often send my radios, base station and repeater in for regular service. When MTMS has training courses out of state we call Frank and he mails the radios, gang chargers and surveillance kits to the hotel. We box them back up and send them back to him at the end of the course. It is a great relationship. Whether it comes to Sat phones or accessories Frank is my guy – one call away. On a regular basis I will get a call from him when he thinks that there is a piece of new gear that I should test. On one occasion we went to his facility and watch Frank submersed a radio in a full sink of water, pull it out and transmit to another completely dry radio. I had no plans to do any waterborne operations but the experiment showed me the advances in technology. 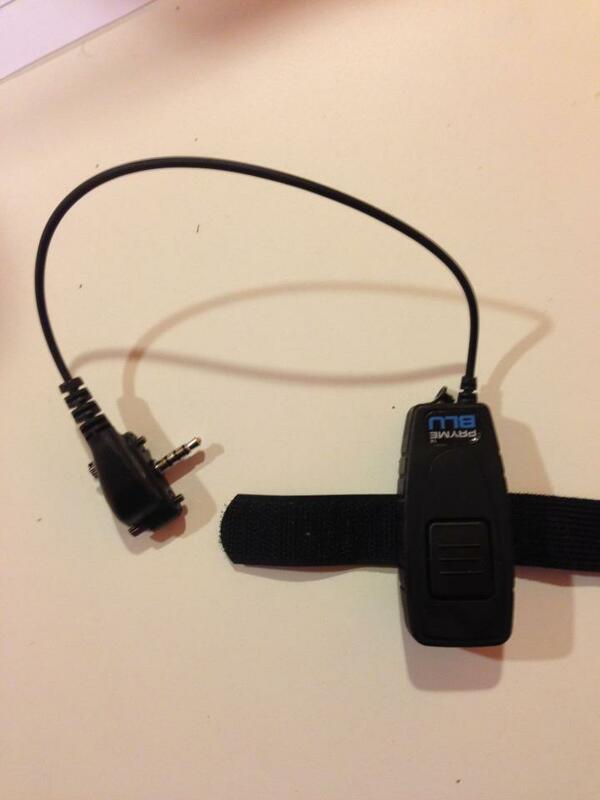 Yesterday I went to Frank’s office to see another piece of gear that he felt I needed to field test – The Pryme Accessories BT-552s Bluetooth Dongle. When I arrived Frank attached the dongle into the two-way radio’s Mic/Speaker jack and began pairing it with a telephone bluetooth earpiece. After the pairing was complete he handed me the radio and earpiece for me to put on. At the end of the dongle attachment is a PTT [push to talk] button that transmits your message through the bluetooh earpiece. I was in the next room and could hear myself transmitting clearly over the radio he held. When he spoke back I could hear him as well. As usual he told me to take it with me to field test. 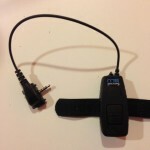 I played with the Pryme Bluetooth accessory and wanted to give you my personal recommendations on the gear. Before I start let me put out a disclaimer here. I encourage everyone to train as much as possible without using radios. Radios are often not dependable for various reasons and when they go out you are stuck if you have not trained to operate without them. Too many people are radio dependant and find false comfort in them. Have your comms go out and watch your specialists start to unravel. This piece of equipment offers another covert approach to communications. The standard pigtail screams some type of security and has evolved into a less than covert appearance. To many the pigtail is a badge of service and makes them feel that they are now doing the damn thing. To those of us that have plugged that pigtail in, switched the radio on and hear that unmistakable BEEP sound, it means GAME ON. Battery life is always an issue with comms. With just a radio we are concerned with one battery. With the Pryme Bluetooth accessory you have to worry about 3: The radio, the dongle attachment and the bluetooth earpiece. The Pryme dongle specs out to 12 hours with regular usage, however we all know that is never the case after repeated use. Depending on what bluetooth device you use your battery life with vary. I have had auditory issues all of my life. I have had my ears operated on, tubes installed and just about every test known to man done on my ears. That said, I experience some level of personal difficulty understanding some transmissions. I know that much of this was due to fact that I was not able to plug the bluetooth device completely in my ear canal like the pigtail to seal off outside ambient noise. The PTT attachment extends only about 10 inches from the radio which limits placement to somewhere on your belt and near the radio unit. With already limited space under our suits, you may find available real estate limited to where you will mount it. The Pryme Bluetooth dongle is an advancement in technology and can serve us well under the peoper application – Covert operations like surveillance and counter surveillance. I am more comfortable with sticking with the standard pigtail which eliminates more outside noises. Lastly, we often do not have the luxury of having access to electrical sockets during the day for extended periods of time in order to charge extra devices. I am not sure about you but the LAST thing I want to add to my gear is 2 more chargers. I am leaving this option for Jack Bauer and Mr. Reese from “Person of Interest” for now.